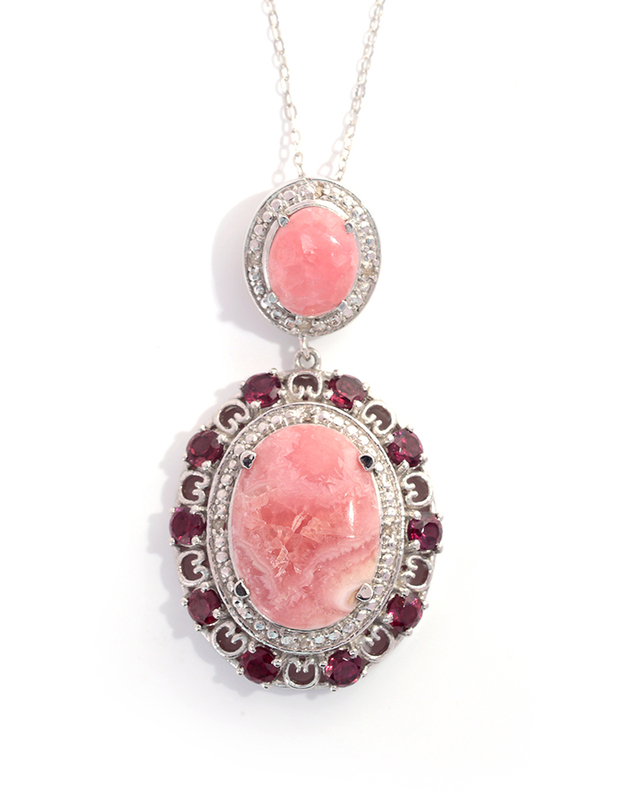 No rose-colored glasses are needed to fall in love with Argentinian Rhodochrosite. This rose-colored gemstone and has gained popularity for its lovely soft color. Famed for its banding, ranging from light pink to bright red, Argentinian Rhodochrosite is a truly unique gemstone. In ideal specimens of this stone, the banding crosses the surface of the stone in a zigzag pattern, with a sharp contrast between colors. The color of this gem is due to the presence of manganese. Generally speaking, the stone is opaque. It is very rare to find crystals of this material. A polished stone will display a vitreous, glass-like luster. Alternately, it will showcase a pearly luster. Gem-quality rough is fashioned into cabochons for use in jewelry. The gem is also shaped into beads or occasionally carved into decorative objects. Argentinian Rhodochrosite is a soft material. Care should be taken with this gem to avoid scratches or chipping. 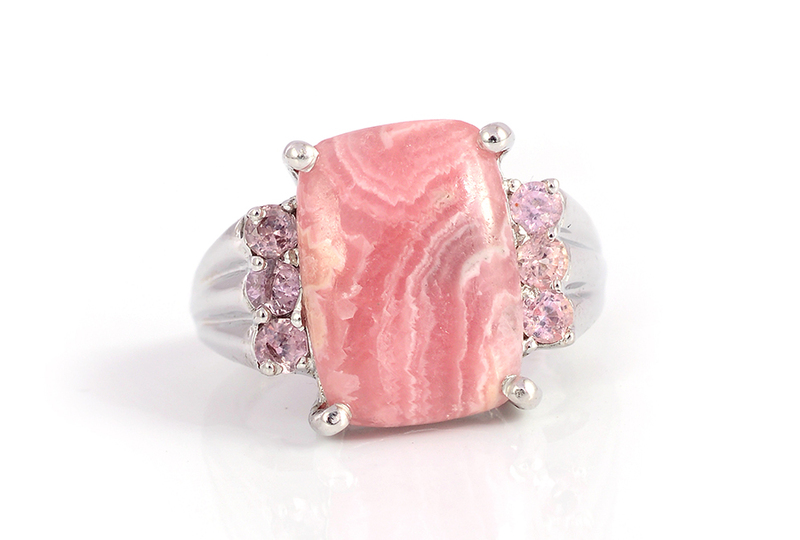 • The word rhodochrosite is derived from the Greek phrase for "rose-colored." • Many deposits of this gem occur alongside deposits of silver ore.
• Rhodochrosite was first discovered in Romania in the early 19th century. • This gem is occasionally mistaken for another gem, rhodonite. Besides their similar sounding name, both are also pink stones. The color of each gem is also due to the presence of manganese. Argentinian Rhodochrosite is sourced from the Capillitas Mine of Argentina. This mine was originally utilized as a source of silver, believed to date back to Pre-Colombian times. 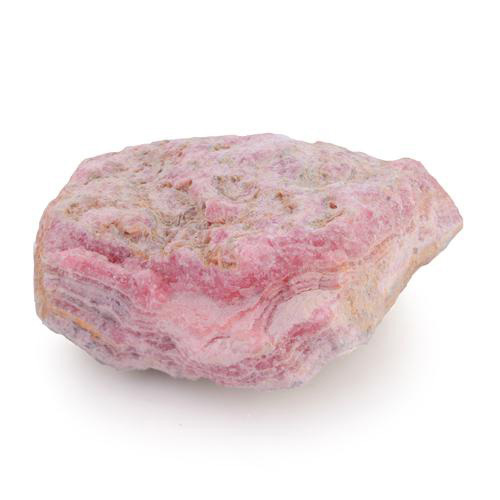 As the popularity of rhodochrosite grew, the mine began to produce this gemstone. Material from this source is notable for its unique banding, typically not seen elsewhere. The effect is created through the formation of stalagmites and stalactites. Each stalagmite is formed over time, as material slowly erodes from stalactites and deposits in layers to its mate. Ranks 3.5 to 4 on the Mohs scale. 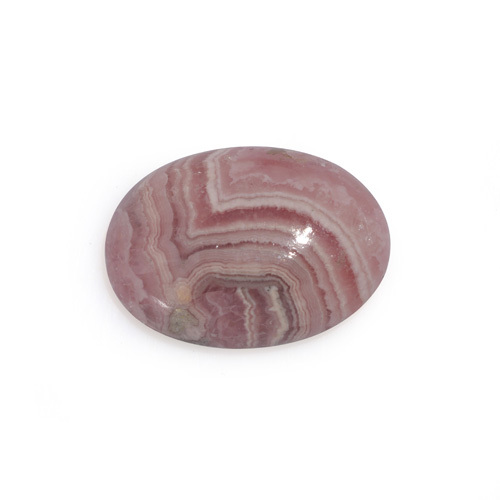 This gemstone is comprised of alternating banded layers, light pink to bright red in appearance. 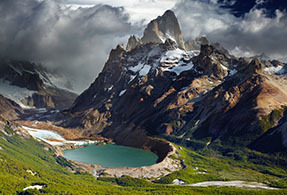 Sourced from Capillitas Mine, Argentina.